Space may be the final frontier, but 95% of the Earth's oceans remain unexplored. The deep ocean could hold the keys to the origin of life and studying it could enable technological and economic benefits to humanity. That's why the 2001 Presidential Panel on Ocean Exploration recommended that the "U.S. undertake a national program in ocean exploration in which discovery and the spirit of challenge are the cornerstones." 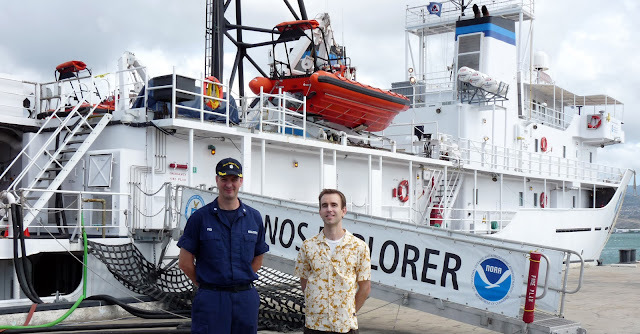 NOAA responded by creating the Office of Ocean Exploration and Research, the great Ocean Explorer educational website, and the Okeanos Explorer ship. I had the priviledge of touring the Okeanos Explorer earlier today. It's worthwhile to distinguish what NOAA means by "exploration" in this context. Exploration is the discovery of new things, not necessarily the detailed study of them. By focusing on exploration, the Okeanos Explorer ("EX" for short), is generating hypotheses rather than answering them. It takes systematic observations to identify new features of interest where scientists may want to later return for more detailed mapping and research. NOAA has a fleet of 19 survey and research vessels operated by NOAA Corps. However, only one of these ships, the EX, is a ship solely of exploration. In that regard, the ship is like the Enterprise from Star Trek, and the NOAA Corps crew is like Starfleet. 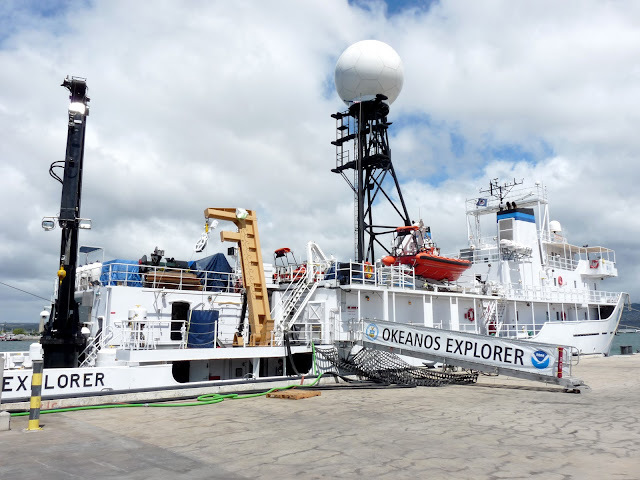 The Okeanos Explorer was commissioned on August 13, 2008 and is therefore one of NOAA's newest vessels. It has state-of-the art technology that allows for real-time high-definition video feeds to be transmitted to scientists at remote locations. This telepresence ability is unique to the Okeanos Explorer and likely represents the future in ocean exploration since it is expensive and difficult to send large teams of scientists on research cruises. It also allows for images and video to be streamed live into classrooms, newsrooms, and possibly even your living room to help raise ocean awareness. 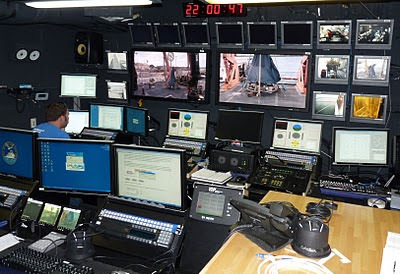 The photos below show the "mission control room" where everything is controlled aboard the ship and the server room that supports it. A big theme in NASA these days is "participatory exploration". Well, this is it. The EX has a new 3D multibeam mapping system that provides high-resolution maps of the seafloor. This is an important tool for discovering new things of interest. 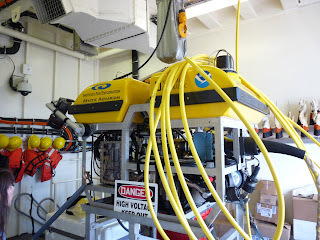 When the ship finds something it wants to study in more detail, it deploys the ROV system. A ROV (remotely operated vehicle) is an unmanned underwater robotic craft with cameras, sampling systems, and other tools for data collection. Compared to human submersibles, they are less costly to operate and can spend longer in deep waters. 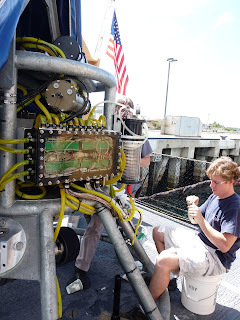 The EX currently has a ROV on loan from Dr. Bob Ballard, the famous oceanographer who discovered the Titanic and advised the Sea Quest DSV show in the 90s. You can see it on the EX's hangar bay on the left below, and someone working on the ship's non-maneuverable ROV (the camera sled) in the center. These two ROV's work in tandem as part of the innovative ROV exploration system on the EX (right image). During the tsunami this past weekend, the EX was in port at Ford Island in Pearl Harbor. They were unable to leave the harbor so had to brace for possible impact in case the tsunami affected them. Luckily, the sea level change within Pearl Harbor was only about a foot so wasn't a danger. I was impressed with the ship's high-tech bridge (see below) and the fact that it can maintain a fixed location within less than a meter using its differential GPS system and thrusters. You can track its location using Google Maps or view a slideshow of EX photos here. 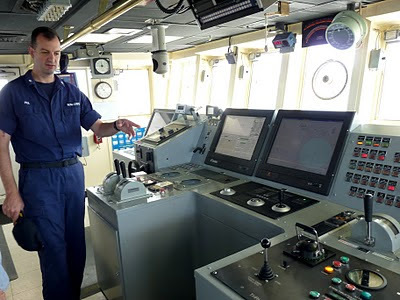 The commanding officer of the Okeanos Explorer is Commander Joe Pica (shown above and below). 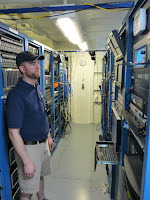 He and Craig Russell, Program Manager for the EX, gave me the tour today. Thanks to both of them for showing me around such an impressive vessel. They will embark from Hawaii later this week for their first field trial of the new ROV system and will later do some exploration in the waters off Indonesia. The same spirit of exploration that drives NOAA to chart the unexplored regions of the sea will carry humanity forward as we explore our solar system and beyond.